One of the main reasons why households and businesses should own a generator is power outage. We can’t deny it; we run out of electricity from time to time because of some factors especially bad weather conditions such as typhoons and tornadoes. In case of a power outage, a generator can still provide electricity so that you can turn on your TV to watch the news. It can also help you charge your mobile devices to keep in touch with family and friends. You can even use your microwave, slow cooker, and other cooking devices so that you can still cook foods even during emergencies. With WEN 56180, you can still use your home and kitchen appliances even in the absence of electricity. With this portable generator, you can use your TV, computer, blender, microwave, slow cooker, and even refrigerator even when the electricity is out. This signifies that even without electricity, you can still watch your favourite television show, go on with your office works using your computer, and cook dishes for your family. No need to worry in times of emergency. Imagine yourself in the middle of the night, the rain is pouring hard and there is no electricity. If you have a portable generator with you, then you will have the confidence that you can protect yourself, your family, and the entire household even during extreme weather conditions. Go camping with friends anytime, anywhere with ample supply of electricity. You and your friends will go camping on a rural area; however, you know that there is no source of electricity there. If you bring with you the WEN 56180 1800-Watt Portable Generator, then you will have a good source of lighting. You can even charge your mobile phones and gadgets such as tablets, iPads and iPods. EPA (Environmental Protection Agency) and CARB compliant machines mean they have passed the strictest standards in order to ensure they are safe and most of all, safe for the environment. WEN 56180 is EPAIII and CARB Compliant. This signifies it is legal to use anywhere across the United States and it is not harmful to Mother Nature. According to the EPA, compliant machines may cost more than other cheap and substandard brands. Nonetheless, choosing compliant machines means ensuring durability and fuel efficiency. For you to properly install any product or machine, it is important that you know first what are the things included in its package. WEN 56180 1800-Watt Portable Generator comes with convenient LEDs that tells if there is voltage at the receptacles. Proper installation of this portable generator is clearly stated on the user’s manual. For usage, as what some review say, it has a pull-start mechanism. Make sure to only operate the generator in an open space and a couple of meters away from your home. Never use the generator in the basement or garage. Determine the combined total wattage of all the devices you plan to plug into the generator. Make sure that the total does not exceed the capacity both of the extension cord and the generator. Use a heavy duty extension cord, attach it to the generator, and then plus the electrical devices. Do not and NEVER attach the generator directly in your home’s electrical wiring. Maintenance, troubleshooting, and repair of WEN 56180 will not be a headache for any users since it comes with a detailed schematic diagram. If you will take the time to read portable generator reviews, then you will discover that WEN 56180 receives almost good feedback. This only proves that this product delivers to its customers what it is advertising. 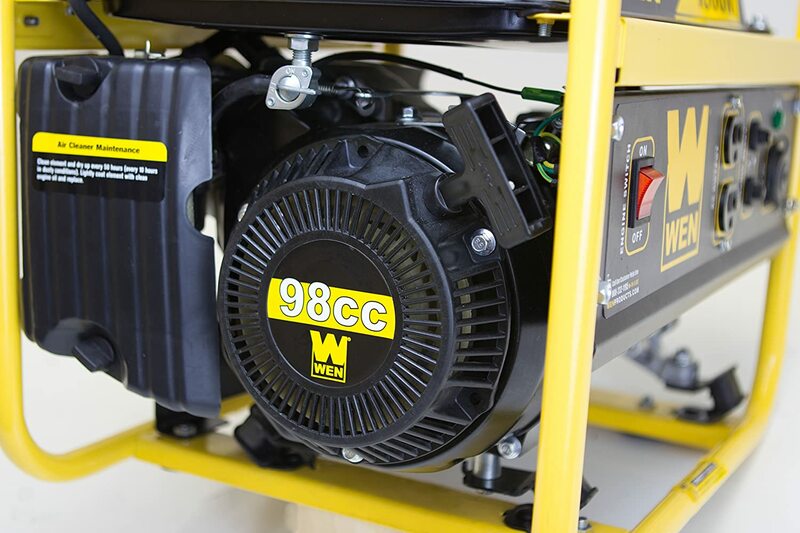 Although it is not a quiet generator unlike other brands and models, the WEN 56180 will give you what you are looking for in a portable generator. Click here to read review WEN 56200i 2000 – Watt, it is another product of WEN brand.